Cherry Red Merino Wool Shawl! It's a bit funny to share about wool shawl when its summer here, but I couldn't resist myself to say yes when pashmina International offered me to write a review for one of their product. Pashmina international is British based company that's provide worldwide delivery. Every pashmina shawl is made with genuine cashmere and fine Chinese and Indian silk blended with Himalayan cashmere wool that gives both cosy warmth and soft comfort. While visiting their website. I just noticed an exquisite range of traditional handmade wool natural shades pashmina shawl in different designs with contrasting floral weave border all along the shawl. They categorized them in different colors and season to make easy for customers to choose their desired one. I wanted to have the offwhite or light colored shawl, but unfortunately they were out of stock so I picked up the Cherry Red merino wool shawl. It's a beautiful cherry red color bring a delightful addition to your wardrobe that complements your outfits and gives you exclusive charm and glamour. 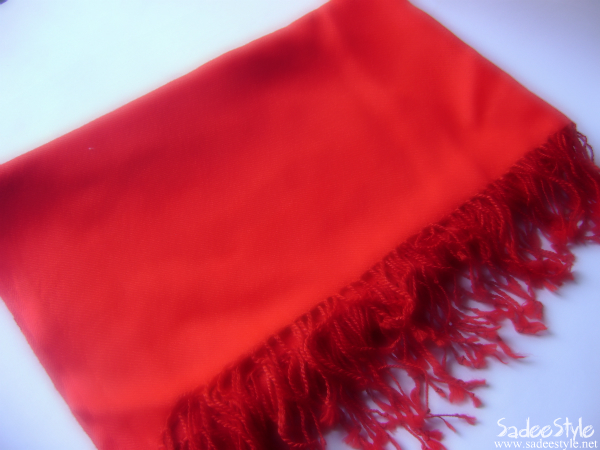 Large Red merino wool scarf: stole size – 28” x 80” (200cm x 70cm). Pure single colour red merino shawl, with delicate woven-in plain pattern. Hard-wearing 100% merino wool blend. Twin ply, with thin tasseled ends. None of pashmina shawls contain viscose or other synthetics. Comes in very right length, nor so big neither too small. It seems like a very good quality product. Good article ! It is gorgeous! I really love the red colour. No wonder Kasmiri Pashminas are the best in the world.. nothing can beat their softness and warmth. The red is beautiful. I love to wear shawls. They are very elegant. Looks like a nice product, too bad you're not a fan of the colour though! Its a gorgeous red color:) sounds like a company that produces good quality stuff, I will take a look at their website. This post is good for me since I'm in the southern hemisphere! I think a big pashmina or scarf is essential for travelling, you can use it as a blanket or a pillow too!